I like to put up my pine cone tree early. It looks festive, but not all that Christmassy, so it can go up before Thanksgiving, without feeling like I’m pushing it. 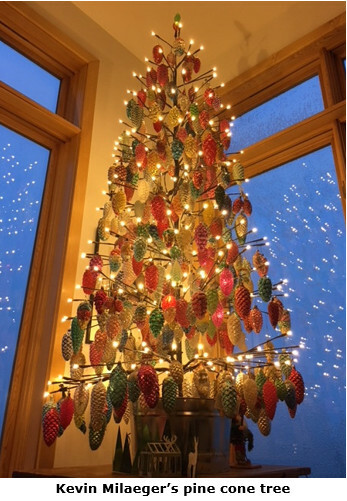 This 6’ tree is decorated only with glass pine cones. It’s a twig tree, so there’s lots of room for ornaments because there are no needles. 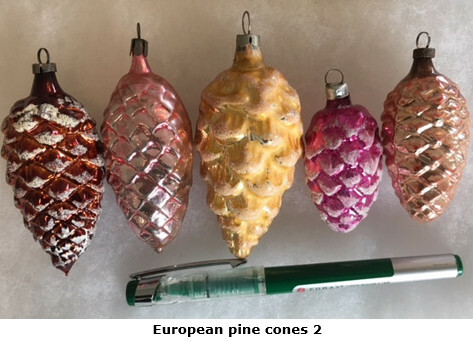 I’ve acquired many cones over the years, and I continue to look for more interesting ones, or unusual colors. 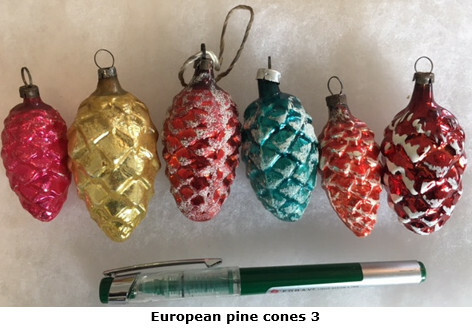 The result of that collecting obsession is that I have way more cones than I need, so I am offering some of the duplicates to you through Milaeger’s. 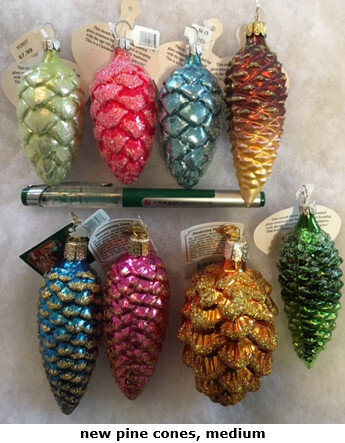 When people first started decorating their trees with glass ornaments, pine cones were one of the first ornaments. 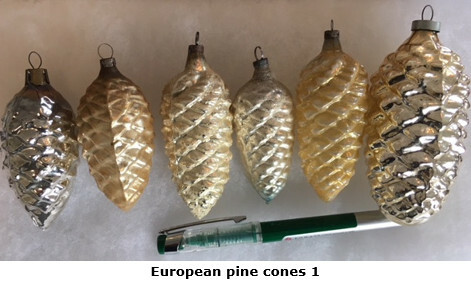 In those early days, the European glass blowers began creating ornaments that seemed to “fit” on a tree----cones, birds, fruit, icicles, and others. There were many styles, shapes, and colors of each. Gradually, other shapes and subjects emerged such as snowmen, santa figures, and many others. 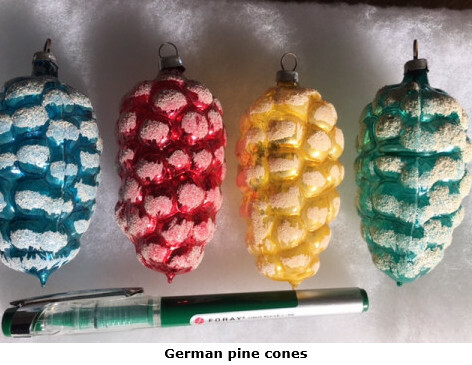 F. W. Woolworth, traveling in Germany, discovered the glass ornaments and began importing them for his stores. 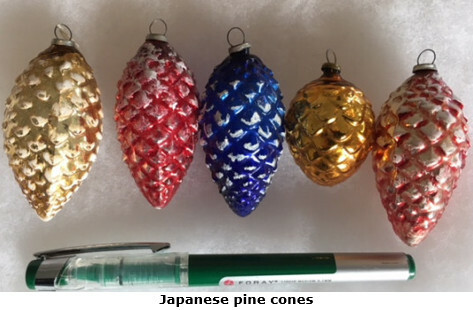 Thus began the first big wave of glass ornaments to America. 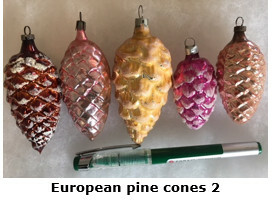 Pine cones have been a popular ornament since they were first made in the mid nineteenth century. They continue to be made in Europe, but many have been made in the USA, as well as Japan. They were possibly made in other countries, but I haven’t come across any. 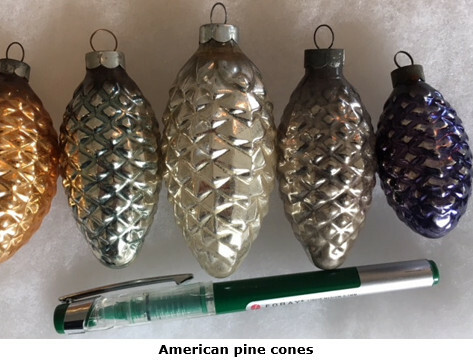 Old World Ornaments, an American based company, has been producing ornaments in China in recent years, but the vintage ornaments we are offering are all older, made well before Old World moved their production to Asia. 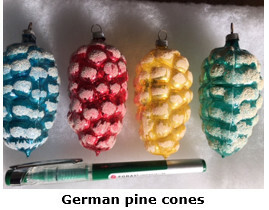 If you like pine cone ornaments you would do well to check out the new ones, too. There are so many shapes and colors to choose from. I have plenty of newer ones on my tree, along with the vintage ornaments. They all get along happily together, in the true Christmas spirit! Scroll down for more and larger images. Please email me if you have any questions or comments. 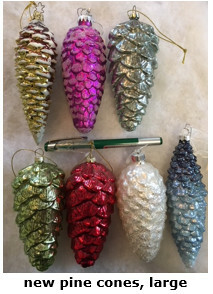 If you are interested in purchasing ornaments pictured in this blog, please contact Rosemary, who handles mail order sales, at 262.693.2040 x101 or info@milaegers.com. 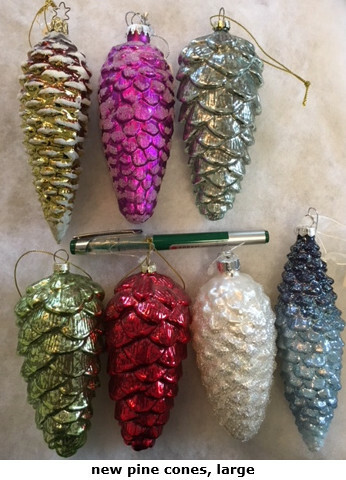 Nov. 22, 2017 - Glass Bird Ornaments---always a favorite!